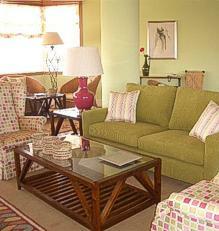 This Pousada will be temporarily closed without a defenite date to reopen. 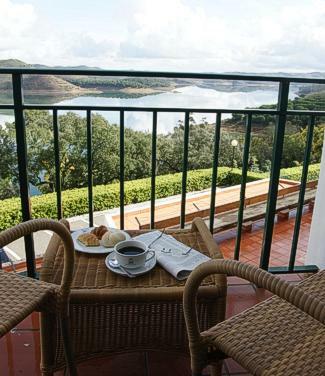 Near the beaches of the coast of S. Vicente, surrounded by a breathtaking mountain landscape and close to Santa Clara dam, you will find the Pousada de Santa Clara-a-Velha. The view from its balconies and swimming pool gives you the tranquility and relaxation you need. Its peacefulness is ideal for shooting, fishing, water sports or even for a rest in perfect harmony with nature. The original building where today the Inn is situated was constructed jointly with the dam, which it was built in 1969. 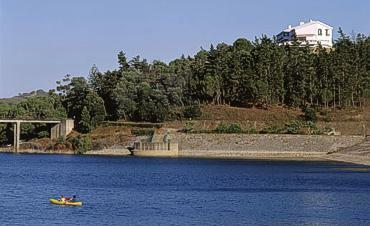 Initially it was the house of the engineers who constructed the dam, remaining itself thus until being reopened as Pousada of Portugal in 1979. 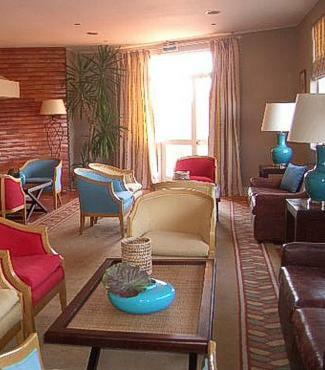 In May 1994, the Inn closed for remodeling under the Architect Corrêa Guedes, reopening in May 1996. 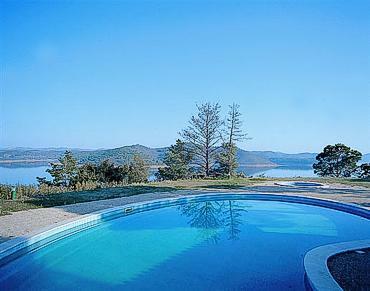 With its unusual location, overlooking the dam and encircled with mountains and green valleys. 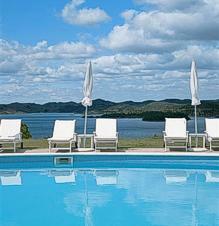 Its balconies and swimming pool, offering magnificent views, inviting one to rest. It's a quite place, ideal for the those who like hunting, fishing, water sports or simply relaxing in perfect harmony with nature. 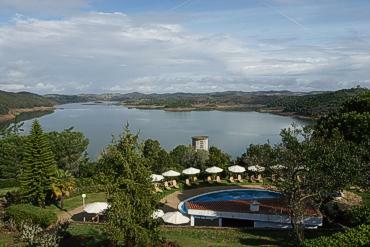 The name, such as the dam, derives from the village nearby, Santa Clara-a-Velha. 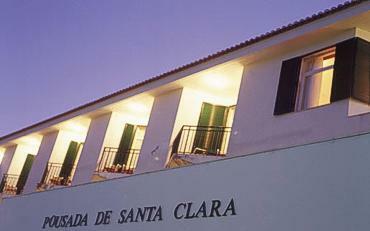 This village of Clara-a-Velha Saint, is about 4 km from the Pousada, and has 1000 inhabitants. The valley covers the streets of the village and it's possible to contemplate the popular architecture and engage in pleasant banter with its inhabitants. Very close is a Natural Park and Costa Vicentina, where the beaches are delightful. 40 km from the Pousada, is the village of Odemira, undeniably attractive, with its whitewashed houses, parks and gardens bathed by the calm waters of the river Mira, the fortress of Vila Nova de Milfontes which once defended the coast from pirates, its outdoor cafes, bars and restaurants, still preserving a familiar atmosphere. The beaches near Vila Nova de Milfontes, on the sleepy estuary where the river Mira meets the sea, are among the most famous due to the excellent conditions for water sports. The local gastronomy is varied, reflecting the countys diversity, but is specially proud of serving fresh fish, from the famous grilled sea bream to fish stew, "percebes" (barnacles), shellfish, conger's stew and seafood rice. The Pousada de Santa Clara is located in the border of Alentejo, the Algarve and the Sea, what makes its gastronomy rich of flavours and aromas. 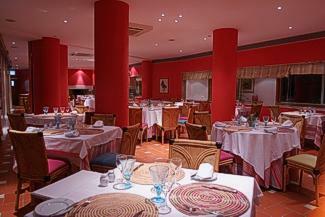 The spicy sausages, regional meats and the special deserts are characteristically of its patrimony. The proximity to the sea also influences some of the dishes. The Pousada has to offer, during all year, a relaxing and fine meal surrounded by Nature. The Pousada de Santa Clara`s location is perfect for water sports, country walks, cycling, haunting and fishing, or simply to relax. The water sports are monitored by a specialized enterprise.